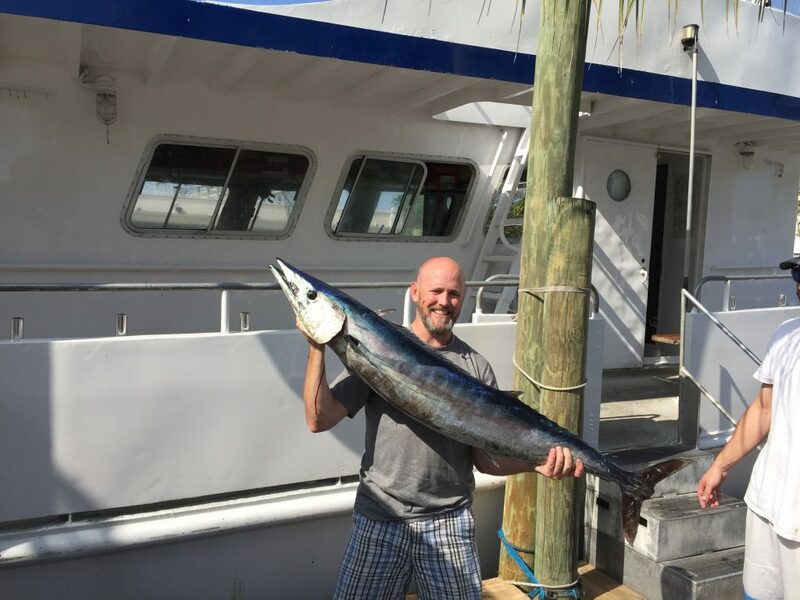 Nice wahoo caught trolling the reef off Fort Lauderdale beach. The fishing this week has been excellent, as it usually is in late December. 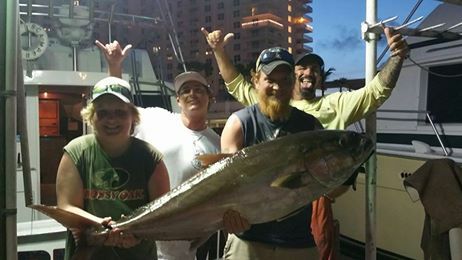 Dolphin, tuna, sailfish, kingfish, amberjacks and more are being caught on our various deep sea fishing trips. I’ve been very impressed with the catches this week, a lot of big fish are hitting the dock. 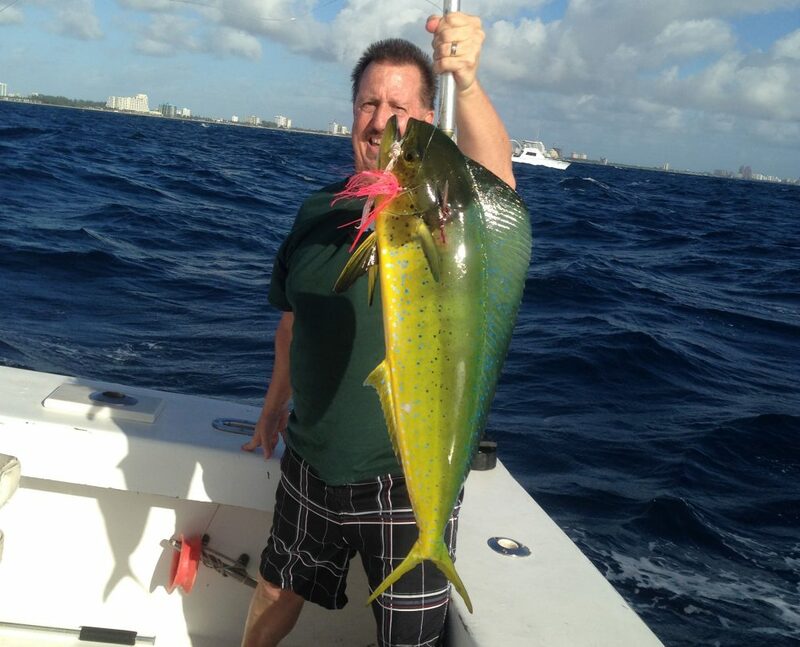 Sailfishing, our most sought after gamefish, are biting very well this month. It’s been a very warm winter for us this year in south Florida. No cold fronts have come through at all as of yet, at least nothing below 70 degrees. By this time of year, we have usually had at least a few cold fronts move through. But this winter, the temperatures have been steadily in the 80’s. We love the cold fronts because the chilly weather gets the sailfish frisky. But this year, they have been frisky even without the cold weather moving through. A great indicator and I can’t wait for the first cold front to hit because I’m betting the second the temperatures hit the 60’s, we will have an awesome sailfish bite occur. 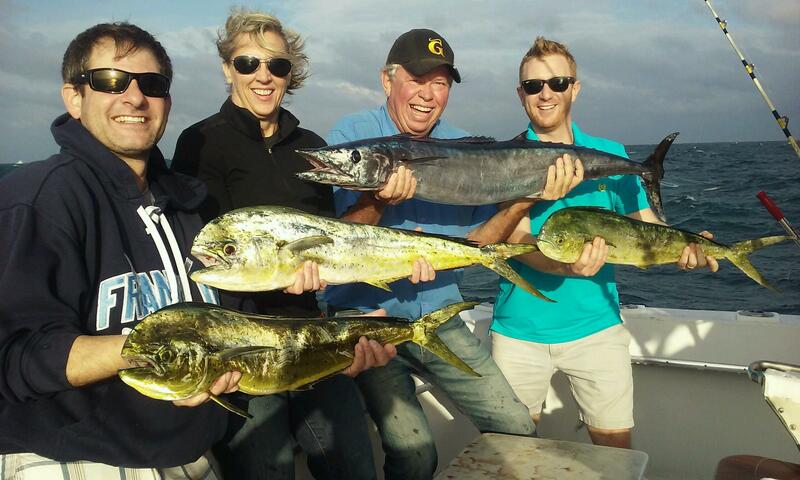 Nice catch of mahi-mahi and wahoo caught on our deep sea fishing charter. Dolphin are biting excellent this month as well. The dolphin, more commonly called mahi-mahi, is another highly desired fish because of their beautiful colors and their great edibility. Dolphin are one of the best eating fish in the ocean. If you catch dolphin on your charter, take some filets immediately over to our local restaurants Quarterdeck or Coconuts. They cook it up for you fresh and there is nothing better than freshly caught mahi-mahi. The dolphin are biting best on the troll, fishing in 120-300ft of water which is about a mile offshore, just outside the reef. They love to eat rigged ballyhoo, dusters, natural feathers, chuggers and just about any other lure you throw out there. Dolphin aren’t picky eaters, you just need to get the baits in front of their nose. On our deep sea fishing charters, we’re catching a lot of schoolie size dolphins as well as a few gaffers too. Nice dolphin just caught on our sportfishing trip. Tuna are all over the reefs. Lots of small ones are schooling up and wrangling bait into frenzied schools on the surface of the water. On calm days, you can see the commotion on the surface of the water where the tunas are in a feeding frenzy from a long distance away. Most of the tunas we catch them time of year are the small blackfins, most of them no bigger than a football. Sometimes though, every once in a while we catch one of the big bomber blackfin tunas. The bigger tunas are powerhouses and put up an incredible fight. And what’s better is you can have some of the freshest sushi you’ve ever had in your life… bring the wasabi and soy! 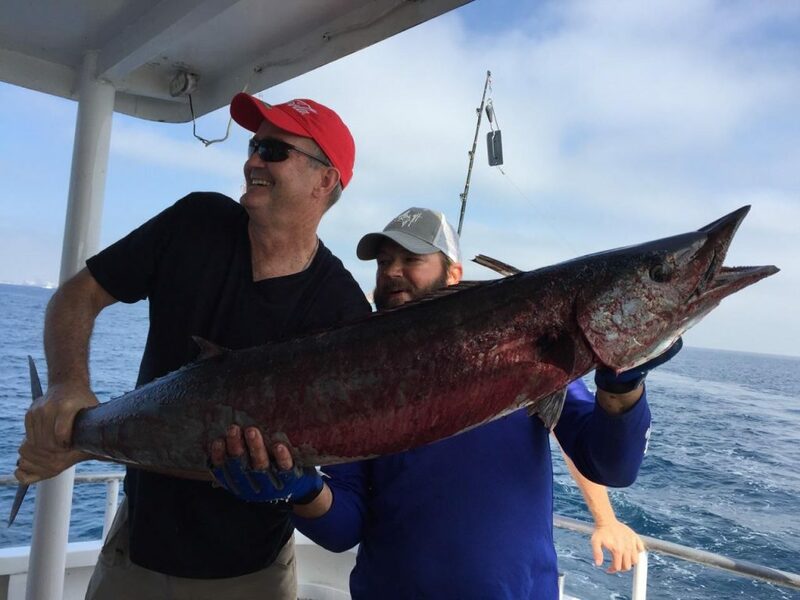 Big wahoo caught on our corporate charter aboard the Mary B III. WAHOO! Wahoo are biting great on the reef this week. 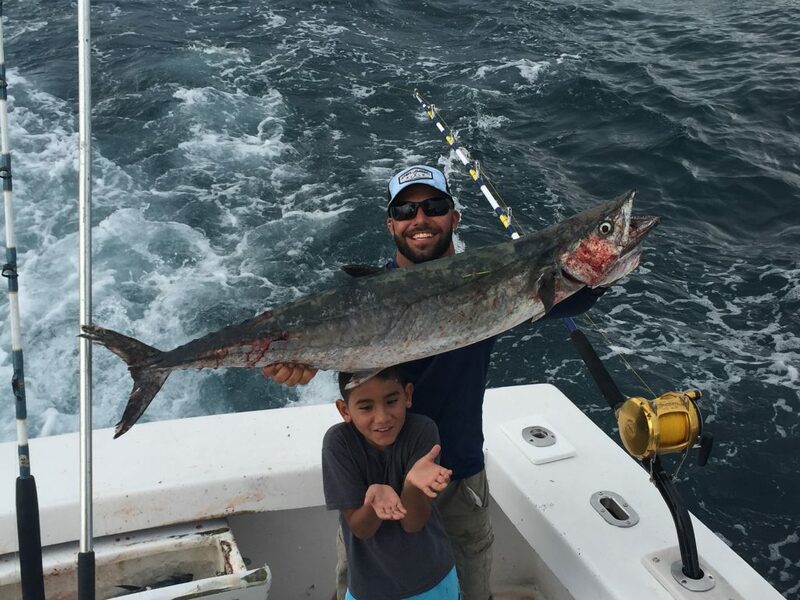 The killer wahoo bite is probably due to the full moon, but they have been biting good all month. This week though, the wahoo bite has increased greatly. Shaped like streamlined torpedo, wahoo are the fastest fish in the ocean. When they take the bait, the scream line off the reel like no other. The initial run when a wahoo takes the bait is unmistakable. While they typically take the deep baits on the wire line or the planer baits, they sometimes travel in schools and hit every line in the spread including the surface baits. It’s indescribably exciting to have all the lines go down at the same time with wahoo at the end. For the next 2 months, wahoo should be bite continuously good. Wahoo love the winter months and some of them get to be quite large. I love catching wahoo, when they bite it always makes the day. 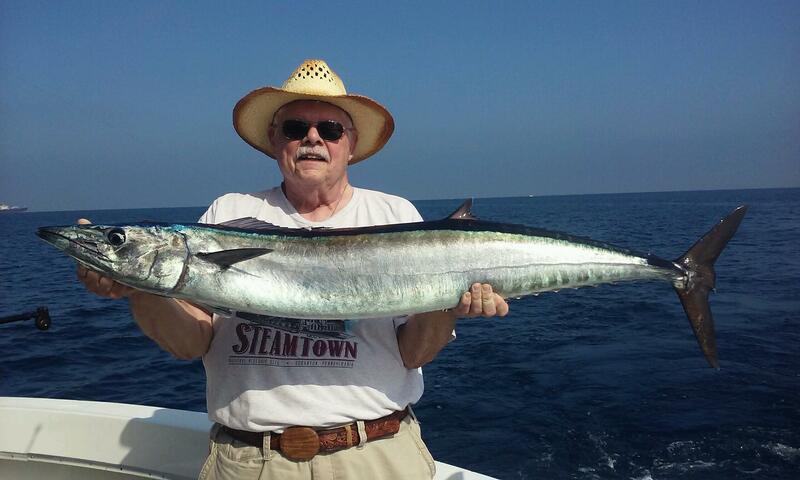 Nice wahoo caught on a trolling trip aboard the Mary B III. Last but not least, the bottom fishing around the deep shipwrecks is going great! A lot of fishermen ignore the wrecks in favor of the excellent pelagic action on the surface through trolling and kite fishing. But this is a mistake. With very few fishermen hitting the wrecks, the wreck fishing gets better and better. Amberjacks, grouper and cobia are all biting around the wrecks this time of year. Groupers are about to go out of season as of January 1. This is your last chance to catch and keep them for a very long time. After the 1st, they must be caught and released all the way until May 1. Cobia are sometimes caught while wreck fishing too. These are highly prized fish and sometimes congregate in schools around our local shipwrecks. Amberjacks are the greatest fighters through. They fight harder than any other fish in the ocean. When you are dropping live baits around the wrecks, you never know what you may catch. We have been very fortunate this month with some excellent catches. I foresee some good fishing throughout the holidays as well. The past 2 years in a row, we’ve had excellent catches over Christmas week. Good luck to everyone fishing out there the next few weeks. I’ll sea ya on the water. Smoker kingfish caught by this young fisherman on a private charter.